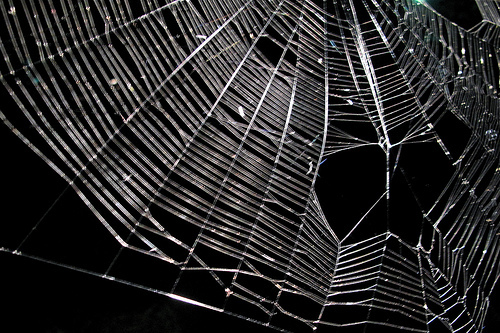 The Web Parenthesis: Is the “open Web” closing? Heard of the “Gutenberg parenthesis”? This is the intriguing proposition that the era of mass consumption of text ushered in by the printing press four centuries ago was a mere interlude between the previous era of predominantly oral culture and a new digital-oral era on whose threshold we may now sit. That’s a fascinating debate in itself. For the moment I just want to borrow the “parenthesis” concept — the idea that an innovative development we are accustomed to viewing as a step up some progressive ladder may instead be simply a temporary break in some dominant norm. What if the “open Web” were just this sort of parenthesis? What if the advent of a (near) universal publishing platform open to (nearly) all were not itself a transformative break with the past, but instead a brief transitional interlude between more closed informational regimes? That’s the question I weighed last weekend at Open Web Foo Camp. I’d never been to one of O’Reilly’s Foo Camp events — informal “unconferences” at the publisher’s Sebastopol offices — but last weekend had the pleasure of hanging out with an extraordinary gang of smart people there. Here’s what I came away with. domain name registrars and web hosting services that, like phone companies, don’t judge your content. But for many users, these principles are distant, complex, and hard to fathom. They might think of the iPhone as a substantially “open” device because hey, you can extend its functionality by buying new apps — that’s a lot more open than your Plain Old Cellphone, right? In the ’80s Microsoft’s DOS-Windows platform was labeled “open” because, unlike Apple’s products, anyone could manufacture hardware for it. “Open,” then, isn’t a category; it’s a spectrum. The spectrum runs from effectively locked-down platforms and services (think: broadcast TV) to those that are substantially unencumbered by technical or legal constraint. There is probably no such thing as a totally open system. But it’s fairly easy to figure out whether one system is more or less open than another. the App Store — iPhone apps, unlike Web sites and services, must pass through Apple’s approval process before being available to users. Facebook / Twitter — These phenomenally successful social networks, though permeable in several important ways, exist as centralized operations run by private companies, which set the rules for what developers and users can do on them. Comcast — the cable company that provides much of the U.S.’s Internet service just merged with NBC and faces all sorts of temptations to manipulate its delivery of the open Web to favor its own content and services. Google — the big company most vocal about “open Web” principles has arguably compromised its commitment to net neutrality, and Open Web Foo attendees raised questions about new wrinkles in Google Search that may subtly favor large services like Yelp or Google-owned YouTube over independent sites. The picture is hardly all-or-nothing, and openness regularly has its innings — for instance, with developments like Facebook’s new download-your-data feature. But once you load everything on the scales, it’s hard not to conclude that today we’re seeing the strongest challenge to the open Web ideal since the Web itself began taking off in 1994-5. Then the Web seemed to represent a fundamental break from the media and technology regimes that preceded it — a mutant offspring of the academy and fringe culture that had inexplicably gone mass market and eclipsed the closed online services of its day. Now we must ask, was this openness an anomaly — a parenthesis? My heart tells me “no,” but my brain says the answer will be yes — unless we get busy. Openness is resilient and powerful in itself, but it can’t survive without friends, without people who understand it explaining it to the public and lobbying for it inside companies and in front of regulators and governments. For me, one of the heartening aspects of the Foo weekend was seeing a whole generation of young developers and entrepreneurs who grew up with a relatively open Web as a fact of life begin to grapple with this question themselves. And one of the questions hanging over the event, which Anil Dash framed, was how these people can hang on to their ideals once they move inside the biggest companies, as many of them have. What’s at stake here is not just a lofty abstraction. It’s whether the next generation of innovators on the Web — in technology, in services, or in news and publishing, where my passion lies — will be free to raise their next mutant offspring. As Steven Johnson reminds us in his new book, when you close anything — your company, your service, your mind — you pay an “innovation tax.” You make it harder for ideas to bump together productively and become fertile. Each of the institutions taking a hop toward the closed end of the openness spectrum today has inherited advantages from the relatively open online environment of the past 15 years. Let’s hope their successors over the next 15 can have the same head start. If you wish to find the ideal web hosting company by going through their reviews given by the top web hosting companies, then check out the MangoMatter website. One of the great fears about the Web as it becomes our primary source of news is the notion that it rips stories from their moorings and delivers them to us context-free. We’re adrift! In a flood of soundbites! Borne upon a river of bits! Or something like that. I’ve never understood this argument. As I tried to suggest in my Defense of Links posts, the convention of the link, properly used, provides more valuable context than most printed texts have ever been able to offer. But links aren’t the only bearers of digital context. Every piece of information you receive online emits a welter of useful signals that can help you appraise it. The techniques described here first filled my quiver in the ’90s, when I worked as Salon’s technology editor. We’d receive story tips and ideas, some of them pretty far out, and we’d scratch our heads and think, “Can this be for real?” I began applying an informal set of tests and checks to try to prevent us from being manipulated, pranked, or turned into a conduit for bad information. This was our way of trying to take the “discipline of verification” at the heart of the journalism we’d always practiced and apply it to the new medium. We knew we’d never be perfect. But there were scammers, hoaxsters and nuts out there, and we were damn sure not going to be pushovers for them. 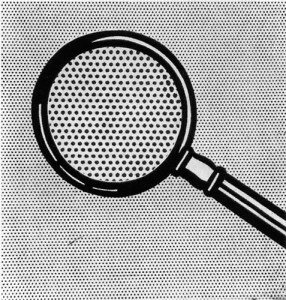 Though some of the details have changed in the intervening years, the basic principles for evaluating an unknown source remain relevant, I think. What’s the top-level domain? Is the page in question on a spammy top-level domain like “.info”? That’s not always a bad sign, but it raises your alert level a bit. Look the domain name up with whois. Is the registration info available or hidden? Again, lots of domain owners hide their info for privacy reasons. But sometimes the absence of a public contact at the domain level is a sign that people would rather you not look into what they’re doing. How old or new is the registration? If the site just suddenly appeared out of nowhere that can be another indication of mischief afoot. Look up the site in the Internet Archive. Did it used to be something else? How has it changed over the years? Did it once reveal information that it now hides? Check out the ads. Do they seem to be the main purpose of the site? Do they relate to the content or not? Does the site tell you who runs it — in an about page, or a footer, or anywhere else? Is someone taking responsibility for what’s being published? If so, obviously you can begin this whole investigation again with that person or company’s name, if you need to dig deeper. Is there a feedback option? Email address, contact form, public comments — any kind of feedback loop suggests there’s someone responsible at home. Is the content original and unique? Grab a chunk of text (a sentence or so), put it in quotes, and plug it into Google to see whether there are multiple versions of the text you’re reading. If so, which appears to be the original? Keep in mind that the original author might or might not be responsible for these multiple versions. Does the article make reference to many specific sources or just a few? And are the references linked? More is usually a good sign, unless they appear to be assembled by script rather than by a human hand. Links in are as important a clue as links out. If your hunt for links in turns up a ton of references from dubious sites, your article may be part of a Google-gaming effort. If you see lots of inbound links from sites that seem reputable to you, that’s a better sign. Google the URL. Google the domain. Google the company name. Poke around if you have any doubts or questions. Then, of course, remember that every single question we’ve been applying here can be asked about every page Google points you to, as well. Once you’ve done some or all of this work, it may be time to actually try to contact the author or site owner with your questions. If there’s no way to do so, that’s another bad sign. If there is, but they don’t answer, it might be a problem — or they might just be really swamped! No one of these tests, typically, is conclusive in itself. But together they constitute a kind of sniff test for the quality of any given piece of Web-borne information. There are probably many more tests that I’m not remembering — or that I never knew in the first place. If you know of some, do post them in the comments. BONUS LINK: Craig Kanalley’s “How to verify a tweet” assembles a similar set of tests for tweets. FOLLOWUP: Craig Silverman’s “How To Lose Your Gut” (at Columbia Journalism Review) has some more tips. I was 18. It would be years before I’d hear of the Internet. I used to find it easy to immerse myself in a book or a lengthy article. My mind would get caught up in the twists of the narrative or the turns of the argument, and I’d spend hours strolling through long stretches of prose. That’s rarely the case anymore. Now my concentration starts to drift after a page or two. I get fidgety, lose the thread, begin looking for something else to do. I feel like I’m always dragging my wayward brain back to the text. The deep reading that used to come naturally has become a struggle. When I experienced this loss of focus, I simply blamed my new condition on my newly acquired adulthood. Carr, apparently, was lucky enough to retain his deep-reading endurance undisturbed from childhood well into his grownup years. By the time it began to slip away from him, we were all deep into the Web era. Carr decided that, whatever was going on, the Web was to blame. It wasn’t something that simply happened; it was something that the Internet was “doing to” his brain. 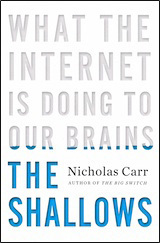 So I cannot fault Carr for asking what the Internet is doing to us. But that is only half of the picture. He fails to balance that question with its vital complement: What are we doing to, and with, the Internet? This imbalance leads him both to wildly overstate the power of the Internet to alter us, and to confuse traits that are inherent to the medium with those that are incidental. I was on vacation for much of the last couple of weeks, so I missed a lot — including the self-immolation of Dr. Laura Schlessinger. Apparently Schlessinger was the last public figure in the U.S. who does not understand the simple rules of courtesy around racial/religious/ethnic slurs. (As an outsider you don’t get a free pass to use them — no matter how many times you hear them uttered by their targets.) She browbeat a caller with a self-righteous barrage of the “N-word” — and wrote her talk-show-host epitaph. I shed no tears for Dr. Laura — why do we give so much air time to browbeaters, anyway? — and I don’t care much about this story. But after reading a post over at TPM about Sarah Palin’s hilariously syntax-challenged tweets defending Schlessinger, I wanted to learn just a bit more about what had happened. So of course I turned to Google. Now, it may have been my choice of search term, or it may have been that the event is already more than a week old, but I was amazed to see, at the top of the Google News results, a story from Associated Content. AC, of course, is the “content farm” recently acquired by Yahoo; it pays writers a pittance to crank out brief items that are — as I’ve written — crafted not to beguile human readers but to charm Google’s algorithm. AC’s appearance in the Google lead position surprised me. I’d always assumed that, inundated by content-farm-grown dross, Google would figure out how to keep the quality stuff at the top of its index. And this wasn’t Google’s general search index recommending AC, but the more rarefied Google News — which prides itself on maintaining a fairly narrow set of sources, qualified by some level of editorial scrutiny. The Dr. Laura n-word backlash made her quit her radio show. It seems the Dr. Laura n-word controversy has made her pay the price, as the consequences of herbrought down her long-running program. But even if it ended her show, it may not end her career. Despite being labeled as a racist, and despite allegedly being tired of radio, the embattled doctor still seems set to fight on after she leaves. 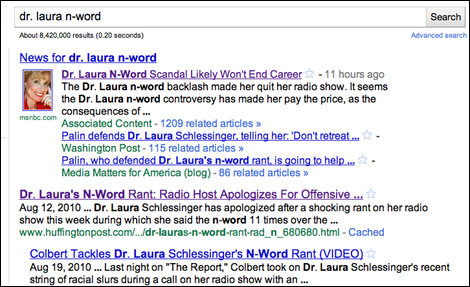 In fact, the Dr. Laura n-word scandal has made her more defiant than ever, despite quitting. I have cut-and-pasted this quote to preserve all its multi-layered infelicities. The piece goes on in this vein, cobbled together with no care beyond an effortful — and, I guess, successful — determination to catch Google’s eye by repeating the phrase “Dr. Laura n-word” as many times as possible. The tech press endlessly diverts itself with commentary about Google’s standing vis-a-vis Facebook, Google’s stock price, Google’s legal predicament vis-a-vis Oracle, and so forth — standard corporate who’s-up-who’s-down stuff. But this is different; this is consequential for all of us. I still feel lucky to be able to use Google a zillion times a day, and no, Bing is not much use as an alternative (Microsoft’s search engine kindly recommends two Associated Content stories in the first three results!). But when Google tells me that this drivel is the most relevant result, I can’t help thinking, the game’s up. The Wagner tubas are tuning up for Googledammerung: It’s the twilight of the bots. As for Associated Content, it argues — as does its competition, like the IPO-bound Demand Media — that its articles are edited and its writers are paid and therefore its pages should be viewed as more professional than your average run-of-the-mill blogger-in-pajamas. I think they’ve got it backwards. I’ll take Pajama Boy or Girl any day. Whatever their limitations, they are usually writing out of some passion. They say something because it matters to them — not because some formula told them that in order to top the index heap, they must jab hot search phrases into their prose until it becomes a bloody pulp. The mark of a real writer is that she cares deeply about literary joinery, about keeping the lines of her prose plumb. That’s what makes writers writers: to them, prose isn’t just some Platonic vessel for serving up content; they care about words. 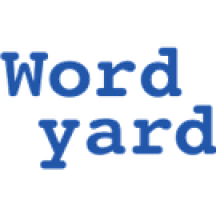 The best bloggers know a thing or two about this “literary joinery.” And even bad bloggers “care about words.” But the writer of Associated Content’s Dr. Laura post is bypassing such unprofitable concerns. He chooses his words to please neither himself nor his readers. They’re strictly for Google’s algorithm. The algorithm is supposed to be able to see through this sort of manipulation, to spit out the worthless gruel so it can serve its human users something more savory. But it looks like the algorithm has lost its sense of taste. Could Google’s neutrality backstab be a fake? News that Google and Verizon are negotiating a deal to “jump the Internet line,” as the New York Times put it in a great headline, shocked people who’ve been following the Net neutrality story and upset many of Google’s true believers. Google has long been one of Net neutrality’s most reliable big-company backers. Net neutrality — the principle that information traveling across the Internet should be treated equally by the backbone carriers that keep the packets flowing — made sense for Google’s search-and-ad business: Keep the Internet a level playing field so it keeps growing and stays open to the Googlebot. It also helped keep people from snickering too loudly at the company’s “don’t be evil” mantra. So why would Google turn around now, at a time when the FCC is weighing exactly how to shape the future of Net neutrality regulation, and signal a course-change toward, um, evil? Here are the obvious explanations: Google wants to speed YouTube bits to your screen. Google is in bed with Verizon thanks to Android. Google figures neutrality is never going to remain in place so get a jump on the competition. None of these quite persuades me. But what if — here is where I pause to tell you this is total speculation on my part — it’s a fake-out? What if Google — or some portion of Google — is still basically behind the Net neutrality principle but realizes that very few people understand the issue or realize what’s at stake? Presumably Google and Verizon, which sells a ton of Android phones, talk all the time. Presumably they talk about Net neutrality-related stuff too. Maybe someone inside Google who still believes in Net neutrality strategically leaked the fact that they’re negotiating this stuff — knowing the headlines and ruckus would follow. Knowing that this might be a perfect way to dramatize Net neutrality questions and mobilize support for strong Net neutrality rules from the public and for the FCC. This scenario assumes a level of Machiavellian gameplaying skill on Google’s part that the company has not hitherto displayed. And if the whole story is a feint, it might well not be a strategic move on Google’s part but rather a sign of dissent inside Google, with one faction pushing the Verizon deal and another hoping to blow it up. Careful with that ad headline! Here is the front page of a flyer that recently dropped out of my newspaper. 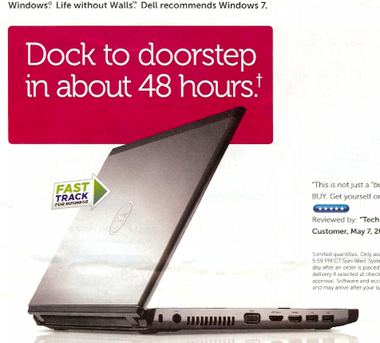 It is an ad for a certain very large PC maker whose name rhymes with that fiery place where bad people spend eternity. DOCK TO DOORSTOP IN ABOUT 48 HOURS. A couple months ago I gave a talk at WordCamp San Francisco, attempting to put WordPress in historical perspective. Those who know the subject know that WordPress’s adoption of the relatively strict GPL free-software licensing is central to its story. (This is the background to the recent dustup between WordPress founder Matt Mullenweg and the creator of the popular Thesis theme over the licensing of that theme.) Ironically, my talk was directly opposite one being given by free-software godfather Richard Stallman, the “Father of the GPL.” It was great so many people still chose to listen to me! I’m having flashbacks these days, and they’re not from drugs, they’re from the rising chorus of media-industry froth about how Apple’s forthcoming iPad is going to save the business of selling content. But these flashbacks I’m getting as I read about the media business’s iPad excitement — man, they’re intense. Stories like this and this, about the magazine industry’s excitement over the iPad, or videos like these Wired iPad demos, take me back to the early ’90s — when media companies saw their future on a shiny aluminum disc. If you weren’t following the tech news back then, let me offer you a quick recap. CD-ROMS were going to serve as the media industry’s digital lifeboat. A whole “multimedia industry” emerged around them, complete with high-end niche publishers and mass-market plays. In this world, “interactivity” meant the ability to click on hyperlinks and hybridize your information intake with text, images, sound and video. Yow! There were, it’s true, a few problems. People weren’t actually that keen on buying CD-ROMs in any quantity. Partly this was because they didn’t work that well. But mostly it was because neither users nor producers ever had a solid handle on what the form was for. They plowed everything from encyclopedias to games to magazines onto the little discs, in a desperate effort to figure it out. They consoled themselves by reminding the world that every new medium goes through an infancy during which nobody really knows what they’re doing and everyone just reproduces the shape and style of existing media forms on the new platform. You can hear exactly the same excuses in these iPad observations by Time editor Richard Stengel. Stengel says we’re still in the point-the-movie-camera-at-the-proscenium stage. We’re waiting for the new form’s Orson Welles. But we’re charging forward anyway! This future is too bright to be missed. But it turned out the digital future didn’t need CD-ROM’s Orson Welles. It needed something else, something no disc could offer: an easy way for everyone to contribute their own voices. The moment the Web browser showed up on people’s desktops, somewhing weird happened: people just stopped talking about CD-ROMs. An entire next-big-thing industry vanished with little trace. 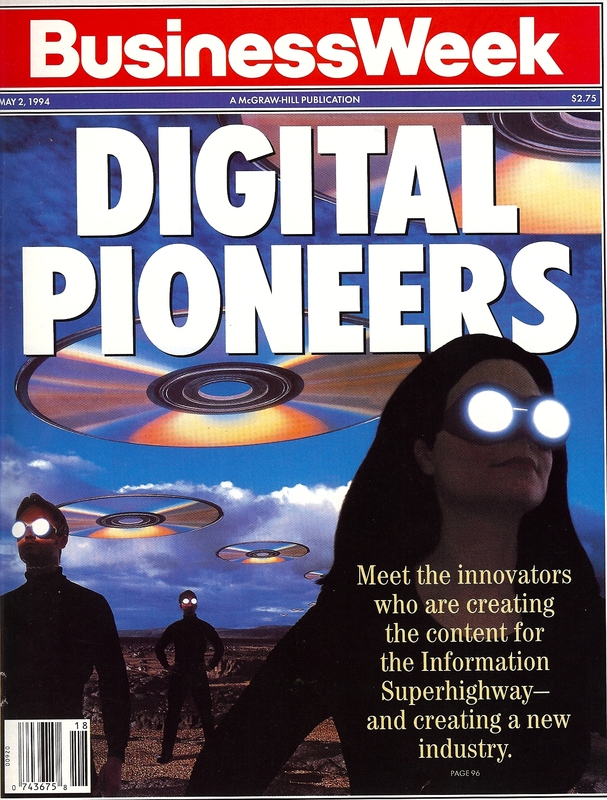 Today we recall the CD-ROM publishing era as at best a fascinating dead-end, a sandbox in which some talented people began to wrestle with digital change before moving on to the Internet. The Web triumphed over CD-ROM for a slew of reasons, not least its openness. But the central lesson of this most central media transition of our era, one whose implications we’re still digesting, is this: People like to interact with one another more than they like to engage with static information. Every step in the Web’s evolution demonstrates that connecting people with other people trumps giving them flashy, showy interfaces to flat data. DOCTOR: Essentially, it’s a do-over. With a new platform and a new way of thinking about it. Can you charge advertisers in a different way and can you say to readers, we’re going to need you to pay for it? Good luck with that! The reason it’s tough to charge for content today is that there’s just too much of it. People are having a blast talking with each other online. And as long as the iPad has a good Web browser, it’s hard to imagine how gated content and costly content apps will beat that. You ask, “What about the example of iPhone apps? Don’t they prove people will pay for convenience on a mobile device?” Maybe. To me they prove that the iPhone’s screen is still too small to really enjoy a standard browser experience. So users pay to avoid the navigation tax that browser use on the iPhone incurs. This is the chief value of the iPad: it brings the ease and power of the iPhone OS’s touch interface to a full-size Web-browser window. I can’t wait to play around with this. But I don’t see myself rushing to pay for repurposed paper magazines and newspapers sprinkled with a few audio-visual doodads. That didn’t fly with CD-ROMs and it won’t fly on the iPad. Apple’s new device may well prove an interesting market for a new generation of full-length creative works — books, movies, music, mashups of all of the above — works that people are likely to want to consume more than once. But for anything with a shelf-life half-life — news and information and commentary — the iPad is unlikely to serve as a savior. For anyone who thinks otherwise, can I interest you in a carton of unopened CD-ROM magazines? Trouble is, Arrington’s metaphor is off. The articles produced by the SEO-driven content mills aren’t like fast food at all. Fast food works because it tastes good, even if it’s bad for us: it satisfies our junk cravings for sugar and salt and fat. We eat it, and we want more. The online-content equivalent to junk food might be a gossip blog, or photos of Oscar Night dresses, or whatever other material you read compulsively, knowing that you’re not really expanding your mind. The stuff that Demand Media and Associated Content produce isn’t “junk-food content” because it’s not designed for human appetites at all: it’s targeted at the Googlebot. It’s content created about certain topics that are known to produce a Google-ad payoff; the articles are then doctored up to maximize exposure in the search engine. individually they don’t make much money, but all they have to do is make a little more per page than they cost. Multiply that by some number with many zeros on the end and you’ve got a business. These businesses aren’t preying on our addictive behaviors; they’re exploiting differentials and weaknesses in Google’s advertising-and-search ecosystem. As Farhad Manjoo pointed out recently in Slate, the actual articles produced by these enterprises tend to be of appallingly poor quality. McDonald’s food may not be good for you, but it’s consistent and, plainly, appealing to multitudes. But few sane readers would willingly choose to consume an SEO mill’s take on a topic over something that was written for human consumption. That’s why I think Arrington’s off-base. The SEO arbitrageurs may make money manipulating the search-engine bots, but they can’t “force feed” their output to real people. Doc Searls’ idealism on this point is more persuasive than Arrington’s lament.